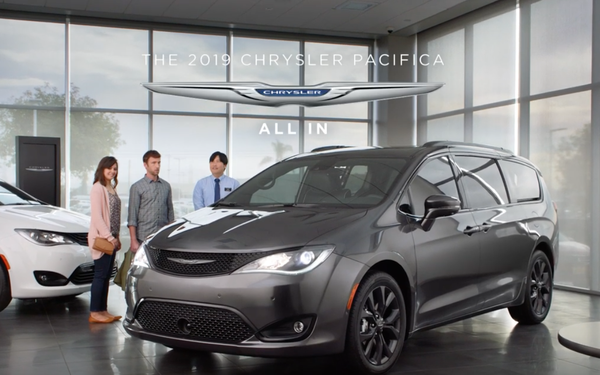 Oscar-winning actor Jamie Foxx takes on the persona of the Chrysler Pacifica and Pacifica Hybrid as the voiceover for a new Chrysler brand campaign. The first 30-second spot, "Are We a Van Family," from Austin-based GSD&M, debuted Monday. Three more spots will also feature Foxx and will air through the remainder of the year across television, digital and social channels. The media buy includes NHL games, NCAA regular season games and March Madness, acording to the automaker. Chrysler partnered last year with actress Kathryn Hahn to launch a series of entertaining videos promoting its new Pacifica S hybrid minivan. The brand does not plan to use Hahn again at this time, according to the automaker. Foxx’s “bold and distinctive attitude” matches that of the minivan, said Fiat Chrysler Automobiles CMO Olivier Francois. “The campaign offers a fun and engaging way to both challenge the perceptions of minivan ownership and communicate to consumers the unparalleled features of both vehicles,” Francois stated.